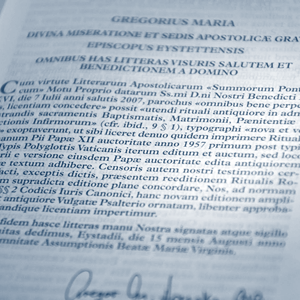 Liturgica Website Reprints "Rituale Romanum"
Y WAY OF the Orbis Catholicus blog, we hear that a reprint of the RITUALE ROMANUM is now available. This is being made possible by liturgica.net, which carefully reprints Latin liturgical books for the Extraordinary Form. Many of its features, unique in liturgical publication today, will cause this Rituale Romanum to stand out as a liturgical book that indeed epitomizes the very best that can be produced in large quantities in our day. Together with our most important partners for the outer appearance of the Rituale – the printer and the bookbinder – we take pride in having overcome some major production difficulties. Similar to what was done inside the Campion hymnal, they don’t just xerox copy the old wood cuts: rather, they digitize and enhance them.